Was it correct to use a wide-angle lens for the above image? Does it work? 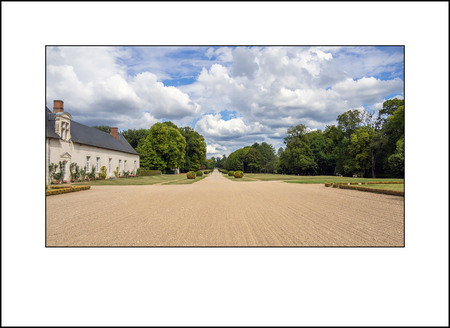 During this trip to the Loire Valley I have come to appreciate the value of wide-angle lenses. I am very pleased with the performance of the Panasonic 7-14 f4 (apart from the purple blob problem on Olympus cameras). My first question to myself having used the lens extensively during the last seven days was "Is there anything wider?". I also managed to get a few shots outdoors with the lens but quickly switched back to the E-M1 and the 12-100 f4. It's obvious to me that interiors are the world of wide-angle lenses. Or maybe it's just me. I know a lot of photographers prefer these wide-angle lenses for their landscape photography but I prefer something a little longer. One problem I encountered was empty space in the foreground and I didn't manage to get around this at all. Maybe there isn't a solution to this. Not every landscape scene lends itself to a wide-angle lens. You have to pick your shots very carefully. I believe this a reason wide-angle lenses aren’t used all that much out in the field. I like negative space but hate empty space. I hope that makes sense. Empty space for me is when there is nothing to fill the foreground. Aesthetically the image doesn't work. Zooming with your feet doesn't really solve this because other higher parts of the image would be cut off. Negative space is when used intentionally to leave space within the image, normally when taking a minimalistic sort of image. Aesthetically the image works. It helps the image. I tend to do this a lot with my minimalistic images. As to a wider lens, I don't think I can get wider at this stage without getting a fisheye but those lenses are not for me. The Panasonic is already a 14-28 in FF terms and that is pretty wide.